Find out how to clean grout yourself and what are the best materials to use to do the job. Cleaning grout will never be easier! Dirt in grout is common among tiled areas. This can affect showers, kitchen floors and any place that uses tiles as its main building platform. The problem is that conventional cleaning methods only make the grout look worse. After mopping up your kitchen floor, the tiles will look perfect but the grout will bring the entire look of the area down. Bacteria is also present in the dirt, so homes with pets should be wary of leaving grout in a less than clean condition. There are plenty of ways to clean up the problem, but this has been proven as one of the most effective. You can’t get rid of dirty grout by using conventional cleaning methods. There is also no point in getting a specialized kit when you can make your own at home. All of the methods used to clean grout use products that are already in the common home. This is a cheap DIY project that will take more time than actual funds to complete. So depending on the size of the area, make sure to allocate enough time to finish it. Gets rid of bacteria in the area that comes into contact with feet and socks. The dirtier the tile, the more likely it is that those same germs will be carried into other parts of the home. An inexpensive way to bring back the original shine of a new home without the help of a professional. Most of the materials you need are already in your cabinets. The entire DIY process for cleaning grout is uncomplicated. You don’t have a laundry list of ingredients to mix and the only safety issue comes from not wearing gloves. Cleaning grout may have a positive effect on allergy sufferers. A lot of the dirt that gets trapped in grout comes from outside the house where it gets stuck in the tile. Very time consuming when it’s done in larger areas. Small areas with tighter spaces will be hard to clean because of the precise movement involved. Users with back and arthritis issues will have problems cleaning grout. The longevity of the cleaning paired with the repetitive movements is not a good mix. Starting off with a strong cleaning solution damages tile that can’t handle it. You have to start out with a mild solution and then make it strong enough until dirty begins to remove easily. Depending on how much traffic is in the area, grout will get dirty quickly even after being cleaned. This is the nature of the material, so you have to decide if the time spent cleaning is worth it. This list is simple, even for tough grout that requires more care. Homemade ingredients are used for this guide, although it is not out of the question to use regular cleaners from brands like Lysol or Mr. Clean. But the specialized nature of the materials around the house ensures that you control the potency of the formula so it doesn’t do damage to your tiles. Vinegar – White distilled is what you want. Stay away from variations of vinegar like apple cider, even if the smell is easier to deal with. The acidity of vinegar is what you’re looking for here, so getting a generic brand won’t make a difference to how well it performs. Baking Soda – This is the alternative to use if the vinegar doesn’t do the trick. Some users like to use the baking soda as a cleaner and then finish it off with vinegar for a better finish. This isn’t necessary, and usually baking soda does fine all by itself. Gloves/Mask – Whenever you’re working with chemicals of any kind, having gloves and a mask will protect your body from the results. Like the rest of the products listed, you don’t need anything high end to boost effectiveness. Generic brands will do just fine in getting the results you want. Brush – Ideally you want a brush that can reach the crevices of the grout rather than a large brush that will miss the smaller areas. There are a lot of options here outside of using a stiff toothbrush, although that has proven to be the most reliable material for the job. Rag/Paper Towels – This is optional, but recommended. You can always use a mop afterwards to clean up, but it is better to use rags and paper towels as you clean. This saves time while making mistakes less likely to happen. Survey the areas that need cleaning before getting the materials together. This will help you estimate how much time is needed to clean each area. Since you’ll be testing a solution until you get the desired strength, it’s also a good time to see how long it takes you to clean a small test area. By the time you start the project, you should know how much time it will take to finish everything. If you’re using the vinegar method, balance it out with warm water. You always want to start out with a half/half option when dealing with vinegar and tile. After blending it together, wet the area with the solution and scrub the grout with your brush to see how much comes out. You want to use circular motions for the best result rather than scrubbing it up and down. If the dirt breaks up easy, then the solution is strong enough for the job. If it requires more scrubbing, then add more vinegar and continue scrubbing until it’s strong enough. The reason you don’t want to take it easy with the vinegar solution has to do with the tiles resistance to harsh chemicals. Without knowing what it can take, using non-diluted vinegar could cause more harm than good. As the dirt breaks up while scrubbing, rinse it with water and clean the area behind with paper towels or rags. An alternative to using vinegar is to make a paste with baking soda and water. This is more of a coarse solution, and is tougher on the surface than vinegar and water. Lots of home owners have used baking soda to clean the toughest stains in the home. As a bonus, it doesn’t leave behind a strong scent like vinegar. For the best of both worlds, use the baking soda solution to clean and finish off the grout with the vinegar solution. Keeping things simple will decide how successful this project is for you. That’s the easiest tip, but there are plenty more that will ensure everything goes smoothly. Even without any experience handling mild solutions, this DIY project is geared for all user levels. All grout between tiles is capable of getting dirty. There is nothing wrong with the particular type you chose, this is just one of the cons of having tile. The only way to get rid of the problem is to get rid of the tile. Unlike other time consuming projects where you can break up tasks into different days, it is better to do this project in a single day. Make it a point to finish each area in the same day that you start it. Mold or mildew are common in the bathroom, so that is what you’ll be removing from the grout. This is important to mention since there is a higher chance of germs causing problems. Always wear a mask and use gloves when cleaning grout so that you don’t get sick from cleaning the area. Start off with a light solution rather than going directly into a strong balance. Vinegar is very acidic and can damage tile when it’s used wrong. Half water and half vinegar should always be your starting point for a new area. Branded chemical cleaners are an option if you don’t want to make your own solution. Unfortunately they are strong by default, so try watering them down before applying a full treatment. A steam cleaner is useful when you need to loosen debris in grout. This is for heavy duty jobs when homemade and branded solutions fail. Prioritize getting a good brush. If the brush is not good enough, then you’ll have to work harder when scrubbing. A good brush saves you time and keeps you from hurting your wrist. Grout sealer is a good buy for long term grout maintenance. Its usage is best after you finish cleaning or once a year. There are different types of sealers based on the area they are used in, so make sure to choose the correct one. There are really no surprises here outside of the brush. Vinegar, baking soda, gloves, mask rags and paper towels can all be purchased for less than $2 a piece. None of these have to be branded, yet most of them like Arm & Hammer still retail for under $2. Where cost comes into play is with the brush, where you will have to do a little better than a generic product. What Is Some Of The Dirt That Gets In Grout? Some of the most common is mildew, mold, pollen, liquids, food and even dirty mop water. When you clean grout with a mop, the water goes deep into the grout and travels. So even when you think dirt is being cleaned, the mop is actually dispersing more dirt along the tiles. This is why discolorations are common with tile that is cleaned with a mop. 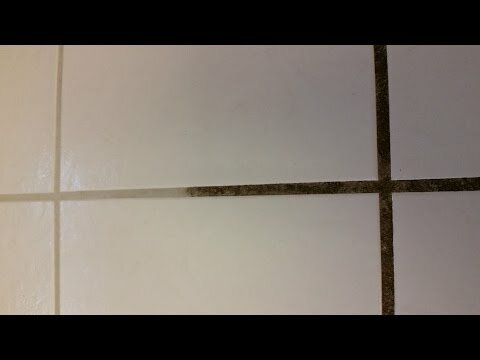 A good way to get past this problem is with proper cleaning techniques that targets the dirt known to be most common in grout. Is A Mop Better For Cleanup Than Paper Towels/Rag? Using a mop will more than likely make things worse when cleaning grout, even when the main function is to clean up behind the main materials. Using a mop for cleanup isn’t recommended. With paper towels and a rag, you can dab at an area without spreading dirt to other tiles. The key here is to clean up as you go rather than do it all at once with a mop. And even if the mop is clean, it does a bad job of getting in the grout like a paper towel or rag. Why Should You Clean Grout? If you have infants in the home that crawl on tiled areas, tile is a danger to their health. Allergy sufferers will also collect pollen from outside and bring it inside the house, where it will find a new home in the grout. The bottom of your shoe, foot, and sock collect all types of bacteria related to allergy, so imagine how much has collected in the grout inside the home. In bathrooms with tile in the shower, mildew gets collected in the grout on a daily basis. A shower unchecked mildew gets worse each day, and is a complete eyesore if you can’t stand the spots that show up on the wall. When Should Special Cleaners Be Used? When homemade cleaners don’t do the job, consider picking up a branded solution that is made to clean grout. Branded solutions are much stronger out of the bottle, so water them down before using them at full strength. A major benefit of using branded cleaners is that they’re usually scented with a nice aroma. Lemon or lavender are popular smells, with orange coming in a close third. Prices on the branded grout cleaners aren’t high, so you won’t derail the DIY project by having to go away from home solutions.